We’d love your help. 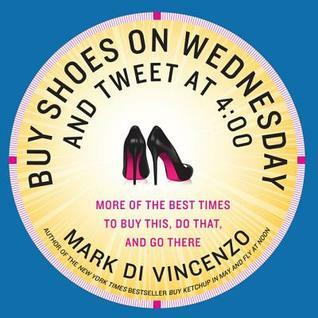 Let us know what’s wrong with this preview of Buy Shoes on Wednesday and Tweet at 4 by Mark Di Vincenzo. 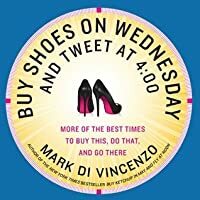 Buy Shoes on Wednesday and Tweet at 4:00, former investigative journalist Mark Di Vincenzo’s follow-up to his bestselling Buy Ketchup in May and Fly at Noon, is another endlessly fascinating and eminently useful compendium of expert tips on perfect timing for a myriad of activities—more of the best times to buy this, do that, and go there. Covering an even wider range of t Buy Shoes on Wednesday and Tweet at 4:00, former investigative journalist Mark Di Vincenzo’s follow-up to his bestselling Buy Ketchup in May and Fly at Noon, is another endlessly fascinating and eminently useful compendium of expert tips on perfect timing for a myriad of activities—more of the best times to buy this, do that, and go there. Covering an even wider range of topics than before—including beauty tips, pets, cars, and children—this book is an absolute must for readers of Schott’s Miscellany and other collections of useful information, and for multi-taskers searching for better, healthier, thriftier ways to do things. After all, timing is everything. To ask other readers questions about Buy Shoes on Wednesday and Tweet at 4, please sign up. As the morning wears on, you can go bowling (it’s cheaper), exercise for weight loss (you‘ll burn more calories) get a massage (your massage therapist will have more energy) and get a colonoscopy (the doc is more likely to find abnormal growths if they do exist). Maybe you can make up a song about your colonoscopy. In the late afternoon, it’s best to knit. (Your hand eye coordination is at its peak). But make sure you don’t knit DURING the job interview. At five, post on Facebook. Your friends will read it as they check in before leaving work. *Do your workouts in the cold! Ideal temp should be 61-66 degrees - you burn calories fa Very informative book ! *Do your workouts in the cold! Ideal temp should be 61-66 degrees - you burn calories faster when you are cold! I was really hoping for more from this book. I read it cover to cover in just a couple of hours, yet most of the tips seemed shallow and could have used further quantitave information to further convey their reasoning. I'm not sure why I borrowed and skimmed this book. I think I am in a "self-help" mood, and skimming it was an easy way to make me feel like I'm improving myself? I did gather one bit of information that i found interesting (https://www.billshrink.com to compare cell phone carriers). Probably because cell phones and new lines are on the back burner at this point and should come to the foreground. Also wonder how long this material stays valid/current.... as his introduction says, look for another a I'm not sure why I borrowed and skimmed this book. I think I am in a "self-help" mood, and skimming it was an easy way to make me feel like I'm improving myself? Interesting book with lots of good advice. A lot of things that seem like they'd be common sense but really aren't that obvious until you think about it......might check out this author's other books too. 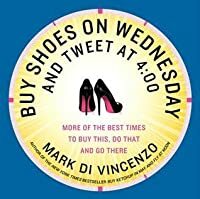 Buy Shoes on Wednesday and Tweet at 4:00 is a book all about the best times to buy/sell/do different things. Some info was more helpful than others. It was a quick read and had some good tidbits here and there. Lots of tips, but much of it things I wouldn't care about. Saw first book on eReaderIQ newsletter 2/25/15 - sounds interesting. Good to know, helpful information. It was okay. I found a couple interesting tips but I really wonder how long this stuff stays valid, like another review pointed out.